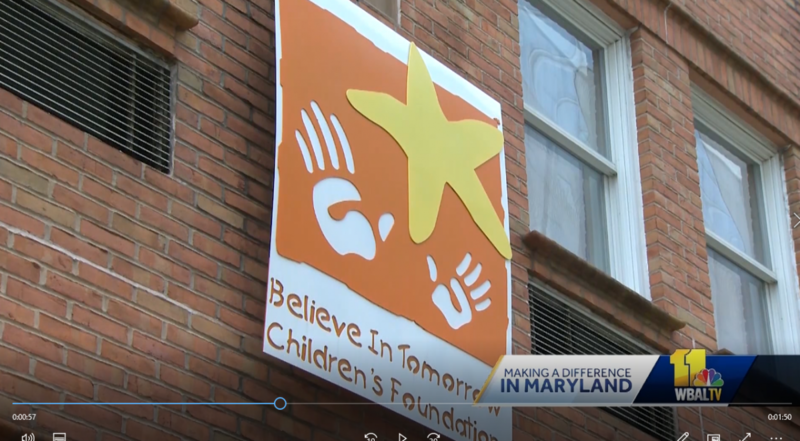 In anticipation of the Believe In Tomorrow Children’s House at Johns Hopkins 25th anniversary celebration this year, Jennifer Franciotti recently spent the morning at Children’s House for the NBC station’s Making a Difference segment. Ella, a Believe In Tomorrow participant and her parents, along with Maryanne Davis, recount the helping effect that Believe In Tomorrow has on children and families. BALTIMORE — Helping families get through one of the toughest experiences of their lives is the goal behind the Believe In Tomorrow Children’s House at Johns Hopkins in Baltimore. It provides free housing for families with children undergoing treatment at Johns Hopkins, and for the past 25 years, it’s been making a difference. Ella Edwards, 9, is quite a celebrity at the house. After all, people see her face before they even step inside. The house, which is volunteer driven and donor funded, provides free accommodations for families with critically ill children undergoing treatment at Johns Hopkins Children’s Center. Like a hotel, there’s a dining room with complimentary breakfast, meals provided at night, a kitchen with private cupboards for families who want to cook, a library and even a recreation room. The house is designed to make families feel at home. The Edwards said it’s a real gift. Last April, Ella was diagnosed with pediatric bone cancer. “We were with Ella for several weeks in the hospital. (We) barely got to see our kids,” Ella’s mother, Jennifer Edwards, said. “You didn’t let me go roller-skating,” Ella said. But the Edwards did get to go on vacation. In addition to two hospital houses in Baltimore, Believe In Tomorrow has receipt housing in Deep Creek and Ocean City. “Yes, that was awesome. I really, really, really liked that,” Ella said. “When she first got sick, we were feeling so off. She couldn’t go to school, and we couldn’t go on vacation, so it was really refreshing for us to just feel like a normal family,” Jennifer Edwards said. “(It was) such a gift to get everyone back together, bring everyone back together as a family,” Ella’s father, Brian Edwards, said. All of the Believe In Tomorrow Children’s House locations operate at full capacity with a wait list every night. “We’ve served all 50 states, and 82 countries worldwide,” Davis said. This year, Believe In Tomorrow is hitting a milestone, celebrating 25 years of making a difference. There is something for Ella to celebrate, too. She finished her treatment and doing great. “It feels like another life,” Jennifer Edwards said.